I am a coffee addict. I have lived in New York for 3 years, and I found coffee was a very big thing there. Everyone likes coffee, especially in New York where many people drink coffee everyday. So I got addicted to drinking coffee. I came back to Japan and now I'm working at a cafe where we serve the best coffee in Japan. It is very tasty and has a fine quality. I want you to experience Japan's greatest coffee. Being a occasional coffee drinker, I always wanted to make my own drip coffee. It's a great experience to be taught how to drip coffee hands on with Fumiko who is very knowledgable and patient. I was first given the chance to taste different kinds of coffee beans (5) and then learn how to drip my own. The cafe is also situated in such a lovely neighborhood with a very relaxing and homey environment. I'm sure I'll visit the shop again soon! Thank you Fumiko and Mui staff for having me! Fumiko was very nice and great teacher, she also prepare the notes for me too. I am very enjoy the time learning how to drip coffee with her and chart with her about other coffee shop in Tokyo. The cafe is located at nice neighborhood area. Fumiko-san explained how to drip coffee using 5 different types of coffee. Let me try to do by myself twice because the first one I poured water too fast. The taste was not perfect. A good activity to spend time for holiday and after that I could take photos of nearby. Perfect. Fumiko was very nice and explained very well all the coffee details. 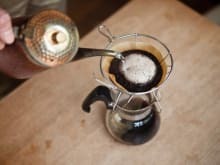 I learnt and practiced how to do a nice dripping and more importantly tasted plenty of coffee and was able to understand better the difference between coffee falvors from africa, latinamerica, and asia. Fumiko gave 100gr of my favorite coffee at the end. BTW the neighborhood is around 40 mins away from central tokyo, however it's a nice place to see less tourists and more japanese. Thanks Fumiko San for the lovely tasting and experiencing the multi rosted coffee you have. I loved the session and would recommend it for coffee lovers world wide.